Increase the efficiency and convenience of your commercial kitchen or bar operation with the Advance Tabco PR-42X30-10-L Prestige series stainless steel pass-through workstation. Items found within the Prestige series of underbar equipment line up perfectly with each other, creating a uniform look across any bar. In addition to a number of eye-catching features, this item boasts an exclusive twist-action leg assembly for added strength and an extended backsplash to create a truly one-of-a-kind unit. 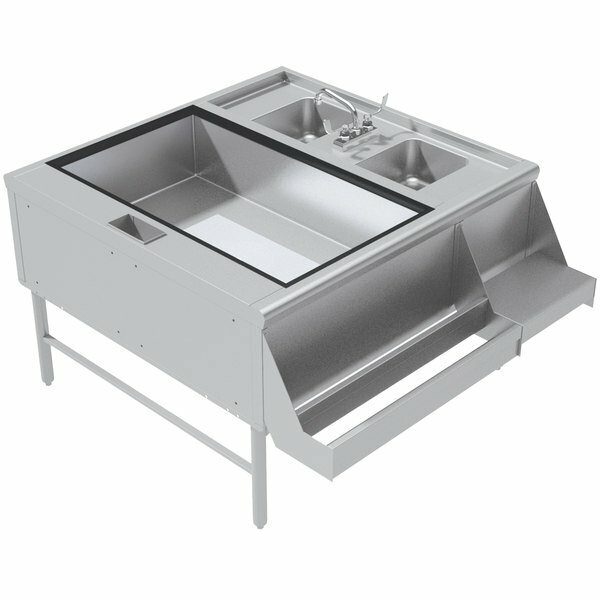 This unit boasts two deep drawn sink bowls that measure 9" x 9" x 4 1/2", along with a 4" K-124 deck mounted swing spout faucet. The unique ice bin boasts 2 lb. density foamed-in-place insulation with a 70 lb. ice capacity and is featured on the unit's left side. Additionally, a cast aluminum 10-circuit cold plate is fitted on to the bin's bottom. Other features include a sturdy design, integrated soda gun tubing chase, double tier speed rail, and a built-in blender shelf with hidden 15A/120V duplex outlet for unparalleled versatility.